Although we call ourselves a "food gardens network" our subscribers, followers, members and supporters include all manner of people with much more on their minds than just food gardens including food growing, food security and access, distribution, consumption as well as adjacent fields like research, sustainability, community building, health, government, education and so on. For me at least, this network is a terrific source of ideas, inspiration, solutions and support. Like many of you I know there's a groundswell of effort in and around greater Melbourne towards establishing a sustainable, resilient food system that helps to build healthy, engaged communities. Until Friday 22nd March though I had no idea of the scale of this groundswell. Have a squiz at this storify page which gives a bit of a flavour of it. Avoiding a traditional conference model in favour of an 'unconference' that used Open Space Technology we shared our stories, explained our visions, sought answers, proposed and promoted projects, challenged preconceptions, gathered support, stimulated debate and more. We were hosted by the fantastic folks at Doing Something Good with sustenance prepared by social Kinfolk using food donated for the event. An amazing show of volunteer power and goodwill. All this in the name of forging a fair food future for our society. Seeing this many people in one place vigorously connecting (or reconnecting), engaging with each others ideas and building upon each others' enthusiasm was energising and inspiring. I can't wait to see the efforts that emerge from all the committed people who attended. Let's do it again! SOON. Come down to the next Veg In Veg Out on Sunday 14 April. We'll have a workshop on how to propagate local native plants with special guest Ann McGregor from Friends of Merri Creek. We'll also sow seeds for autumn crops to share - peas, coriander, lettuces and broccoli just to name a few. Seeds, cuttings and seed-raising mix provided, just bring your curiosity! For anyone who loves buying fresh food from the people who make or grow it, some very exciting and welcome news arrived a little while back. In addition to the farmers' market held every 3rd Sunday at Pascoe Vale Primary School, Moreland will soon host farmers' markets on the 2nd and 4th Saturdays of every month! 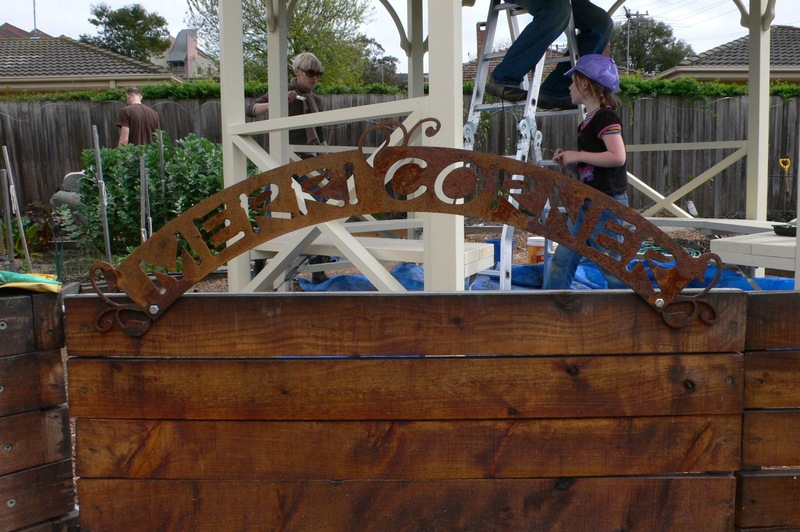 The market will be hosted by Coburg North Primary School and is organised by Melbourne Farmers' Markets, the same crew behind Veg Out (St Kilda), Slow Food Market (Abbotsford Convent), Collingwood Children's Farm, Gasworks (South Melbourne). The market is accredited by the Victorian Farmers' Markets Association so you can be sure the person selling the produce either grew it or made it. Spread the word, BYO shopping bags and we'll see you there!